Have you seen The Wrecking Crew yet? It’s a documentary about some of the most prolific studio musicians of all time: people like Tommy Tedesco (guitar), Carol Kaye (bass), Hal Blaine (drums), Plas Johnson (sax), Glen Campbell (guitar), Leon Russell (keyboards) and dozens of others. They were the de facto “sound of the ’60s,” as they played, uncredited, on thousands of records. 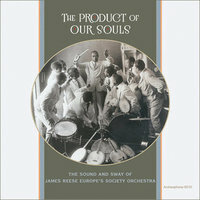 The group were not called “The Wrecking Crew” at the time; rather, historians came up with the name later on to describe the changing of the guard from the old studio musicians of the 1930s and ’40s to this new batch of upstarts that came along in the late ’50s and stirred everything up. These guys could and would play anything, including rock ‘n’ roll, and that provided them an opening with the young producers. So apparently, it’s not the Association you hear performing on “Windy,” nor the Byrds on “Mr. Tambourine Band,” nor the Monkees on most of their early stuff (we all knew that already). It’s various members of the Wrecking Crew. Nobody agrees on who was a member of this skilled group or whether they were really a group or a brand at all. They were simply the top-notch union musicians of the day, and they answered the phone when it rang. A couple of the most fascinating parts of the program are when it takes an in-depth look at the work required of the Crew by some of the most peculiar and demanding personalities of the era: Brian Wilson and Phil Spector. Wilson taped nearly a hundred hours to get “Good Vibrations” just the way he heard it in his head. For members of the Crew, sessions with the Beach Boy were just an item slated on their schedule, several days a week for seven months, taking up long hours, often after midnight. The musicians interviewed spoke glowingly of Brian: how musically knowledgeable and innovative he was, how dedicated he was to teaching them their parts, what a stickler he was for detail. They all called Wilson a “genius”—but if it weren’t for the competence and professionalism of the Crew, we’re led to believe that those sessions might still be going on today. If you’re in the New York City area, you may want to reserve a spot at the Edison National Historic Site (ENHS) for tomorrow’s talk on Edison’s talking dolls, which were made by an experimental division of his lab during the 1888-1890 period. Our friends, Robin and Joan Rolfs, owners of two of the preciously rare original dolls, will be giving the main presentation. The details can be found on the Thomas Edison National Historic Park’s Facebook page. 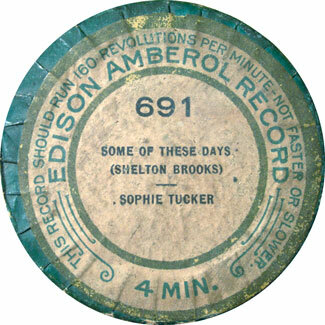 Eight talking-doll cylinder recordings still exist in one form or another today, and Archeophone is proud to have provided audio restorations for the ENHS project. Two of the original specimens, the earliest ones of all, were made of metal! The other six are made of brown wax and probably all date to about 1890. 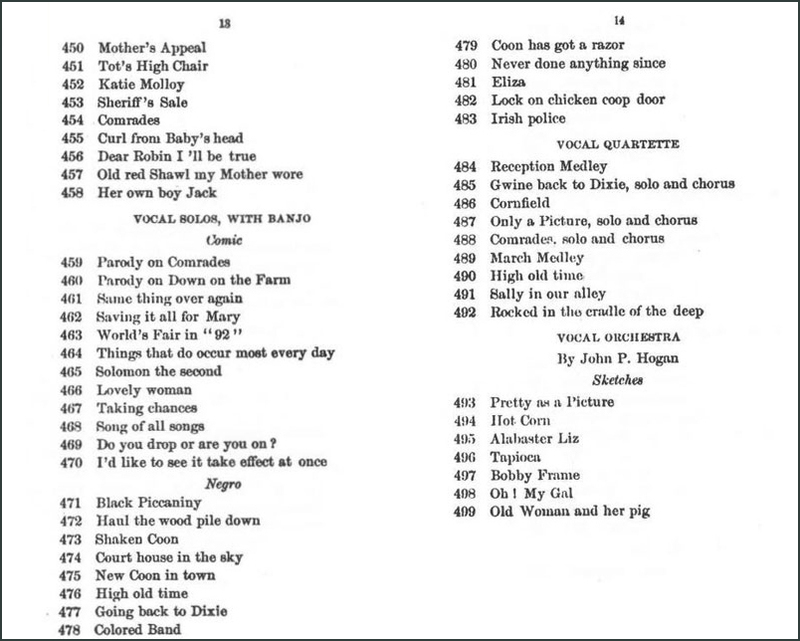 Some of the records were transferred using standard contact technology (such as the Archeophone universal cylinder playback system—not associated with us), others had to be scanned optically (using the IRENE system), and some are older recordings of the dolls actually playing their internal treasures and being recorded with a microphone. As many of you know, especially those of you trying to hunt down those choice Paramount blues sides from the late ’20s, a record doesn’t have to be old to be rare and desirable. 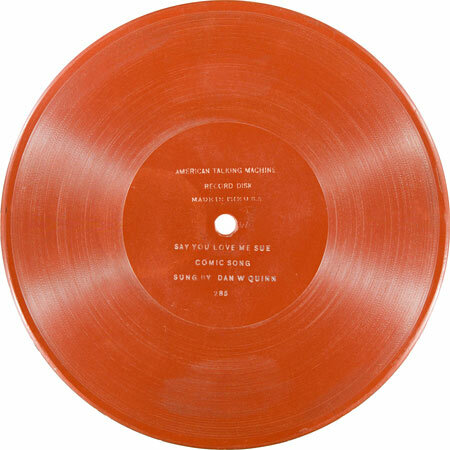 It’s just a matter of whether the maker of the record stayed in business long enough or had any kind of market reach. Behold the case of the American Talking Machine (ATM) Company, maker of the Vitaphone talking machine and bright red-brick-colored seven-inch Vitaphone discs to go with it. This company was the second business to challenge Berliner’s Gramophone flat discs. 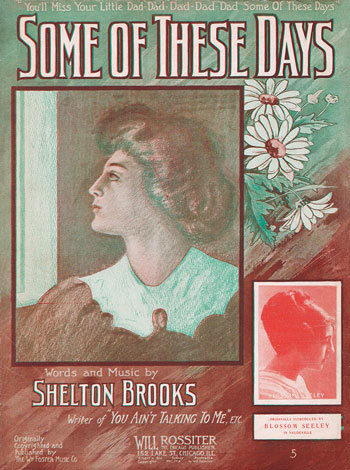 The first, Wonder records, made in 1898 by the Standard Talking Machine Company, were obvious pirates of Berliner discs and Standard was quickly sued out of existence. Good luck finding one of these discs today. 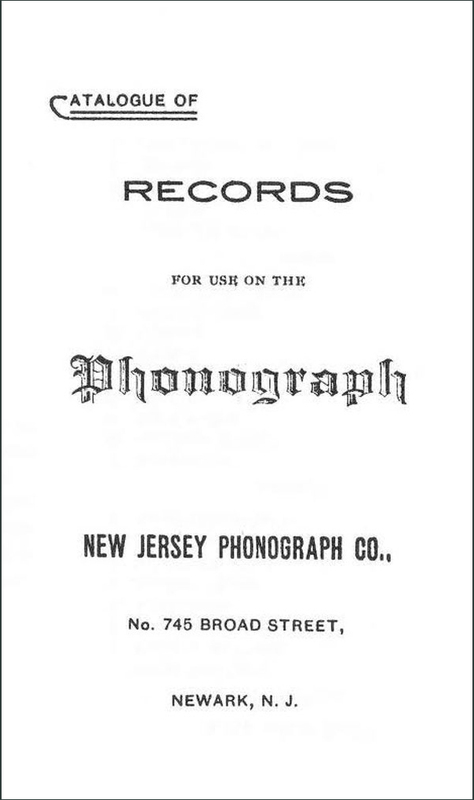 The ATM Company, however, was buoyed up by the patents of the American Graphophone Company (all licensed to Columbia)—which gave them a little more time to penetrate the market in late 1899.